We have been talking about Sales & Marketing Alignment for for a long time, yet we STILL see the same seven mistakes being made. This webcast describes all 7 mistakes and offers a solution to each. Highly informative and engaging. RECOMMENDED ! Customers no longer want to be sold to. They now want sellers that help them to make an informed decision. But how do business leaders go about moving their business and their people into this new era? This webinar is ideal for B2B Business Owners, Salespeople and Sales Leaders who want to quickly fill their sales pipeline and accelerate their sales results with field-proven techniques. If you are a B2B business owner or run a B2B business and want sustainable sales growth then this is a must-see webinar for you! Peter Strohkorb, international expert on customer centricity in sales and marketing (smarketing) outlines the ten customer touch points that will make or break your business. B2B Sales and Marketing Growth Specialist Peter Strohkorb describes why and how every business now needs to apply push and pull selling techniques in order to win more customers. Peter will reveal the Ten Action Items you need to have in place to be successful. B2B Sales and Marketing Specialist Peter Strohkorb describes why and how every business now needs to apply push and pull selling techniques in order to win more customers. This webinar is ideal for B2B Business Owners, Sales People and Business Leaders who want to quickly fill their sales pipeline and accelerate their sales results with field-proven techniques, but without spending a lot of time or money. It is valuable for salespeople of all calibers, and even for non-salespeople who would like to better understand how selling can work for them. How much better would your life be if your sales prospects gave you their upfront permission to pitch and sell to them? It would be awesome, right ? So, how can you get them to give you that precious permission? Book yourself into my webinar now. "The Top 7 Sales Growth Challenges, And How To Solve Them." Working with our clients we come across many challenges to sales growth, but there are seven of these that we encounter all the time. They do not need to remain a challenge for your business as we have already solved them in our clients' organizations. Now you can benefit from our experience, too. This talk is aimed at senior sales and marketing leaders and their C-suite executives. It outlines the research-based reasons that sales & marketing alignment is important and spells out the QUANTIFIED business benefits. More importantly, it offers a structured method to MEASURE that alignment in your organization and how to EXECUTE it. There is an opportunity for Q&A at the end. Use this opportunity to hear directly from a world leader in this space. Register now. LinkedIn just released its global research report ino sales & marketing alignment. The findings are compelling"
In this webcast Peter Strohkorb, international expert on sales & marketing alignment, will present the report findings and add his own perspective on the problem and on how to overcome it. Plus, a Q&A opportunity for you to ask Peter your own questions. Register now and receive a free copy of the LinkedIn report ! Grab this opportunity to ask your own business questions to Peter Strohkorb, the international author, speaker, mentor and expert on sales & marketing, customer experience and social selling. No holds barred, Peter will give you quality, high value answers. And as an extra bonus Peter offers you the opportunity to a 15 minute private phone session with him. Book your private 1-on-1 call with Peter now in the survey section of the BrightTalk registration page for this webcast. According to Gartner, 89 percent of CMOs want to differentiate their organizations through superior customer experience. But how do we get there ? What works, what doesn't ? How can we get there successfully ? This webinar will address these matters and others in plain, actionable English. Well worth watching. To be very clear: any 433% improvement result is unusual. But it shows just how powerful it is when your Marketing and Sales teams work together effectively. See the CEO talk about how his company achieved this fantastic result. Sales Enablement has traditionally been a technology-focused matter. But what about the people ? What about the customer ? This webinar explores how customer centricity can make an excellent sales enablement tool and offers tips and tricks on how to avoid the pitfalls. 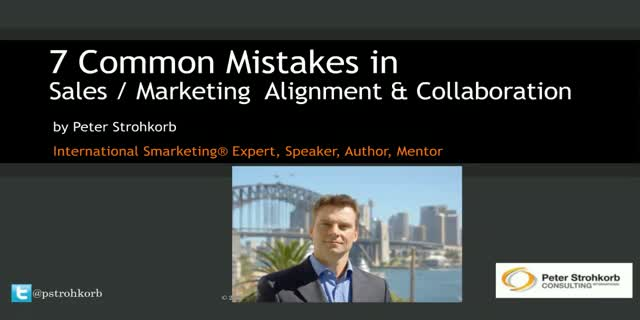 Peter Strohkorb talks about why Smarketing® is important to business performance,the 7 most common mistakes in Sales & Marketing Alignment, and how to avoid them. For business leaders who want to boost sales & marketing performance and customer experience.